It's twenty years since we all swooned over "The Man from U.N.C.L.E. 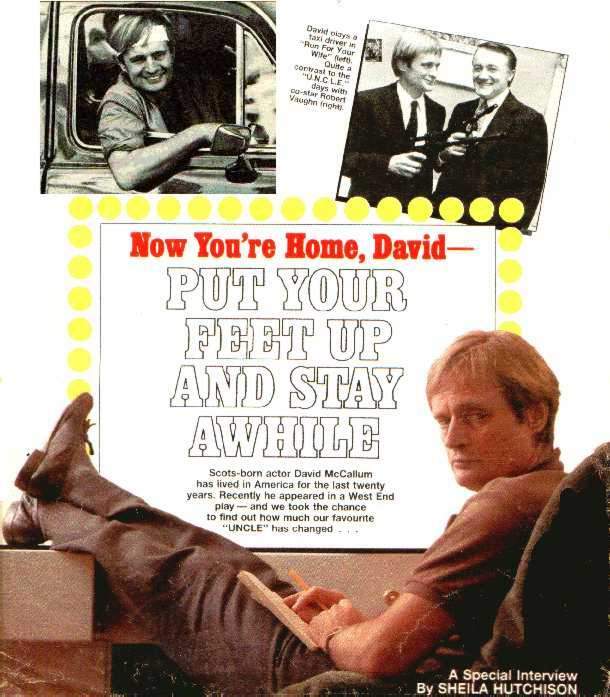 ", I think to myself as I arrive at London's Criterion Theatre, and here I am meeting David McCallum and he doesn't look a day older! What has happened in that time to the fair-haired "Russian" from that long-running series? David is in London appearing in the highly successful comedy "Run For Your Wife", and he honestly doesn't seem to have changed at all. David, naturally courteous, comes out to meet me and together we walk back to his bright, newly-painted dressing room. An avid reader of good fiction, he's deep into a William Boyd novel. "Do you know," he asks, recommending it, "I was an officer in the Gurkhas at the time this man was born? That makes you think, doesn't it?" His quite dreadful, feverish cold would make most stars put off an interview, if not actually retire to bed! But Virgos don't give in easily and David is no exception. His romantic profile may suit the violin--which he once began to 'squawk' on, following his musician father--but one senses a strength of will behind the disarming manner. David was born in 1933, in Kelvinside, Glasgow, where his father was leader of the Scottish Orchestra and others. In 1936, the family moved down to Hampstead Garden Suburb until war began in 1939. "Both Sir Thomas Beecham and Sir Henry Wood wanted Father for the London Philharmonic and the London Symphony Orchestra, respectively. I heard later, that at the time, a cartoon appeared in a Glasgow paper, showing Father in his kilt, holding his violin case, with Beecham and Henry Wood fencing with their batons above his head. The caption was "If music be the food of love, what ails these knights?" Beecham won and Father came down as Leader of the London Philharmonic." The McCallums went back to Scotland in 1939. "We were evacuated with gas masks over our shoulders," David puts it picturesquely. They went to Stirling and Stuarton, Aryshire. David went to school on the banks of Loch Lomond. "That school is now an art gallery. I found that out last year when I took a look. I brought my wife, Katherine, and our children, Peter, who is fifteen, and eleven year-old Sophie on a 'Roots' trip. I showed them everywhere." David also has two older sons from his first marriage, both boys now in their 20's. He is a great believer in work, is particular about what he does, and likes to hang on to the rewards of hard work and success, which is why he went off to settle in the States. Also, it helped him "to keep his horizons broad." Since he never takes holidays, how had he managed a "family" one in Scotland last year? "The excuse for that trip, which had been planned over a long time, was my Uncle John Abercrombie's fiftieth wedding anniversary. That was a good excuse for the entire clan to get together in Bridge of Allan. It really was a marvelous holiday. We also have six hours of the most boring video tape you have ever seen in your life!" David laughs. "It's wonderful to have and the children are always playing it." Though he doesn't ever wear a kilt, like some expatriates, David's fondness is for the Scottish countryside and he loves to see his relatives and keep fresh his early memories of damming burns with his brother, now an antiquarian bookseller in Somerset. "My Uncle John, an architect, showed us how to take turf and stones and build dams and we used to go out and dam the streams to form swimming pools. Then we'd have picnics of stovies cooked on a wooden fire. When the pool was full we'd swim in it. At the end of the day, we'd let this great tidal wave go on down--much to the chagrin, I'm sure, of the local farmers!" David laughs, masking, one might think, that Scottish reserve he has retained after so many years of living in the States. "On that trip, after Uncle John's anniversary, we drove up to Aberdeen and around through Macduff, where my Aunt Kitty lives. We finally stopped at the top of the loch there and went to all the places where Macbeth was. Peter had just played Fleance in the opera of 'Macbeth'. "We saw the castle where the murder took place, then came down by all the lochs into Appin country and round the Western Isles and back down to Glasgow. Peter had been to Scotland when he was small; Sophie not at all. It was their first conscious awareness of how gorgeous Scotland is. We ate .... but didn't have time to go fishing." David likes to eat. His domestication, in the apartment he shares with his interior-designer wife and their children, stems from his love of food. This love has resulted in his being able to cook anything. "I like to cook, whereas Katherine doesn't. She's a very good cleaner--she likes to clean up. So we make a good combination in the kitchen! I can make beds and clean places if have to--when I'm away. But I know that whenever I want to eat say some stir-fry vegetables with beef or beef broccoli, I can cook it. Though I'm not one of those crazy people who thrusts his cooking on to other people. But when we have dinner parties, I do the cooking." David hasn't the air of eternal youth just by accident! Though by no means a vegetarian, he and his wife keep to a low-fat, high-fibre (sic) diet. They tend to live on whole-grain bread, vegetables, fruit and cereals. "When shopping, I don't even think about buying pork any more and very rarely buy lamb, because of its high fat content. We say that everything in moderation and a good glass of wine when you need it is the way to live. You know, I'd like to be a grandfather, so longevity is something I look forward to--if I can remain healthy!" David would like to play much more golf than he can find time for. At the moment he manages about half a dozen games a year. He does morning exercise and jogs with Katherine. "We usually get up in the morning in New York and ran a couple of miles when we get going. By half past six we're back at the apartment then we shower and get the children up and off to school." David looks serious. "I think it's important to get the heart rate up on a regular basis. It's very gentle. We don't run; we just jog." Does David worry about anything? He certainly doesn't look as though he does! "No, I don't think so. One of the most important things on earth is to avoid stress. For example, I have this lousy cold given to me by my company manager, and I have to do a performance tonight and two tomorrow. So I don't even think about tomorrow. I don't even thing about two acts tonight--only one. "I go out and do the first act and then go out and do the second. Take it all as it comes and try not to worry. Problems are sent to be solve--that's why they are there." David is considerate and easy to deal with. Does he ever get impatient or blow his top? "No, not really--maybe now and then. I think tolerance is one of the most important things in life. We all go through terrible periods of anxiety and so on. You suffer them, but once you've been through them, you can learn a certain degree of tolerance towards yourself. This allows you to be tolerant towards other people. The whole idea of Man being born equal is a ludicrous idea. We're not! Some of us are much more fortunate than others." Effort and excellence are two things David sets great store by. "I think the more you strive to improve your own self, the more you will then be in a position to do things for other people. I think the greatest gift we have is that we can do things for others. I hate mediocrity and laziness and all forms of dodging. I just love all the things we can do as human beings. Everything that you do in relation to other people should be the best you can. The opposite is appalling." David says he's not at all religious in a formal sense--he finds it difficult to equate ministers preaching with certain aspects of the Christian religion--but he is deeply religious in a personal sense. He loves going to church in New York, especially at times such as Christmas. "There's a magnificent Church of Heavenly Rest, up on Fifth Avenue, where we go. If I lived in any permanent way in New York, I'd like to be more involved. It's really the only church that has touched me in a formal sense," David pauses thoughtfully. "I feel humble when I think of the microcosmic status of human beings within the universe in the great scheme of things." Why does David, a man with a real feeling for landscape, who likes to draw, and always carries a sketch-book and pen, choose to live in a city as all-embracing as New York? Does he prefer town to country? "I have always analyzed that like this. When you wander about and you're not particularly with anybody, but you're looking at what and who is around you, you're either comfortable or you're not. I've found New York's a very comfortable place to be. "Everything's there--it's open twenty-four hours a day--and there's a standard of excellence and energy around you all the time. I find it comforting and invigorating. When it gets tiresome or too much, we go out to the beach. We have a little house out in Long Island that we visit at weekends and in the summer." Does his wife, who designs people's apartments and offices, choose the furniture for their homes, too? "Oh, yes. Everything we have is completely Katherine!" He laughs. "When I arrived here at the Criterion to do 'Run For Your Wife' they painted the dressing room for me and I picked the colours (sic). I had to. When Katherine came over recently to see me, I was loath for her to see it, in case I'd done the wrong thing! But she didn't say anything!" David and Katherine are very involved with their children, supportive and interested in their schools and their singing. They are immensely proud that Peter has been elected President of his class--an important thing in America. David tries to be as available as possible for Peter and Sophie. "I try to write home every other day. Using a computer and word processor is wonderful, because I can write a letter in pieces through the two days. Then finally it's paragraphed together. I do a mild edit, rip off two copies. (sic) One goes to Peter, who has just gone on to boarding school and the other goes to Katherine and Sophie in New York. So it's like a newsletter that goes out all the time." When David had spoken to his son on the telephone the previous week, Peter hadn't been able to make up his mind what to do as a subject for his mid-term report and he had been able to help. "He said he was thinking about Roman architecture. Next day I went and bought a whole lot of books on the destruction of Pompeii and so on. I sent them airmail to him at school. Hang the expense! He has now said he's going to do Roman architecture so it's lucky I sent the books!" As a schoolboy, David's first musical instrument was the violin, then he played the cello for a while before finally he took up the oboe. He was taught by Leonard Brain, the famous oboe player in the Royal Philharmonic Orchestra, and played for some years, ending up in the Junior Orchestra of the Royal Academy of Music. "But I became hooked on the theatre quite early on and dropped my musical studies, From the age of twelve, or even earlier, I worked with BBC Radio--with all those wonderful actors like Laidman Browne in the BBC Rep. I had an Equity card at twelve and after a spell at University College School, Hampstead, I went on the Royal Academy of Dramatic Art." Music remains a passion for David. "I play the flute now slightly, " he admits. "It's terribly hard but I can play along with people. I tootle away sometimes on my own. To me, music is just phenomenal, and I'm glad the children have picked it up. Sophie is in the children's chorus of the Met. Opera. Peter used to be in it, too. "I love listening to music late at night, through headphones. I have a compact disc player--that's a tremendous luxury." In 1961, after a year at Glyndebourne, a spell at the Oxford Playhouse and other work here and on the Continent, David went to the States to play Judas Iscariot in "The Greatest Story Ever Told." He is honest enough to admit he had a hard time of it at first, because it's very difficult to settle in a new country. David says that doing "The Man from U.N.C.L.E." remains one of the highlights of his life. "It's still ubiquitous. It's not counter-espionage but tongue-in-cheek, satirical lunacy. I was a Russian working for NBC fighting crime. It was all crazy, but wonderful. I never saw the series at the time because we were always working, but I've seen some of them since and they're very stylish, and also very funny. "I didn't realize how good they were." He laughs and goes on to say that they're all presently running nightly on American TV. "I loved doing U.N.C.L.E.--the company and crew were wonderful. It was shot in Los Angeles where all the films I'd seen as a child were made. So I met all the actors in those films and worked with George Sanders and Joan Crawford. All those wonderful people. "I went through a divorce. My wife Jill met Charles Bronson and eventually married him. I met Katherine and we got married and I moved to New York. It was an extraordinary time. Hollywood is a fantastic place and I have good memories of that time." What does David miss most over here? "I miss my mother dreadfully since she died. She and I were very close. I'm getting more to look like her as I get older. My father died over twenty years ago and the pain is a little less. It's also intensely gratifying to know that I spent the last few years of her life close to her. "I spent a lot time with her and she came to us. So I have all those memories which don't go away. Though you have the bereavement you also have the complete captivity of her soul, which is very comforting. "There's no sadness about my mother's death. She had a very positive and wonderful life. Her sons were both doing well -- my brother was running West Germany for the British Council at that time -- when she died. She did what she wanted to do, so I don't feel sad. And when we meet" (that laugh again) "she'll cook the bacon and eggs and we'll have some celestial tea together!" Ever-thoughtful David comes out to see me off, then returns to nurse his ailing throat for the next performance.